Equity returns are more dependent in bear markets than in bull markets. Previous studies have argued that a multivariate GARCH model or a regime switching (RS) model based on normal innovations could reproduce this asymmetric extreme dependence. We show analytically that it cannot be the case. We propose an alternative model that allows for tail dependence in lower returns and keeps tail independence for upper returns. 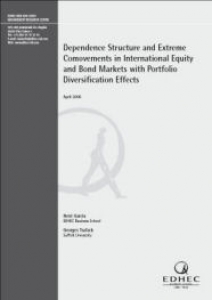 This model is applied to international equity and bond markets to investigate their dependence structure. It includes one normal regime in which dependence is symmetric and a second regime characterized by asymmetric dependence. Empirically, we find that dependence between equities and bonds is low even in the same country, while dependence between international assets of the same type is high in both regimes, especially in the asymmetric regime. Empirical phenomena such as home bias investment and flight to safety are amplified by asymmetric dependence through coskewness.